Sherlock Holmes Mysteries takes you into the gritty underbelly of London’s late Victorian era. Inspired by Guy Ritchie’s recent film, this Warner Brothers adventure game puts you into the role of Sir Arthur Conan Doyle's most famous detective. The premise behind the game is simple enough: you—as the titular detective—are entrusted with getting to the bottom of two mysteries through a combination of cunning, brute force and cold logic. The game has everything that makes a good Holmes tale: puzzles, brilliant deductions, and the occasional bare-knuckled fistfight. On the iPad, this man's hat is even more impressive. 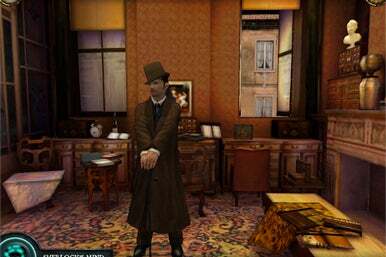 Holmes takes place in a series of 3D environments—including Sherlock’s famous Baker Street flat—where you have the opportunity to look for clues by interacting with the things and people around you. On some occasions, you must “inspect” an object with particular attention in order to find a certain number of clues. Inexplicably, the search must be concluded within a specific amount of time, or you will have to start over; this makes sense in some cases (such as when you’re trying to sneak past a bob with a drinking problem), but otherwise feels a little forced. Having collected the appropriate number of clues, you must then assemble them in “Holmes’ Brain,” where the correct combination will yield a deduction and take you a step further into the game. Unfortunately, some of the deductions feel like they would be more at home in Homer Simpson’s head, while others are obscure enough to require a considerable amount of frustrating guesses, thus making this aspect of the game a little uneven. When mind power alone can’t get you the next clue, a first-person fist fight with London’s worst types will usually yield better results. The fight interface, which requires you to perform a series of strategically-timed taps and swipes to hit and defend yourself from your adversary, is both intuitive and fun to use, while the increasing speed and ability of the computer foes keeps things fresh and challenging throughout the game. Despite its considerable shortcomings, this game is likely to please Holmes fans by immersing them in a familiar environment and giving them a change to stretch their deductive abilities. The mysteries are a little on the short side (in all fairness, one of them is clearly intended to be a tutorial), but well worth the $1 price tag—particularly on the iPad, where the game’s graphics really shine.